Office Hours: Mon 11-1 or by appt. 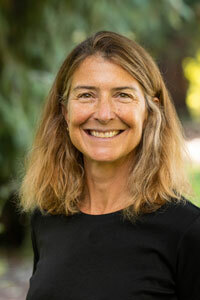 Leah Middlebrook received her Ph.D. in Comparative Literature in 1998 from the University of California, Berkeley, where she specialized in sixteenth-century Spanish, French and English lyric poetry. She spent 1994-95 in Madrid as a Fulbright scholar. From 1998-2000 she was Andrew W. Mellon Postdoctoral Fellow in the Humanities in the Department of Comparative Literature at Stanford University, where she continued on as a lecturer in 2000-2001, before joining COLT and Romance Languages in 2002. Dr. Middlebrook’s research and teaching interests include the lyric, poetry and poetics, theories of the subject, and critical constructions of Western modernity, particularly as they shape our ideas about the “early” modern. She has published essays on Spanish Petrarchism, on the “body politics” of the lyric of Marguerite de Navarre, and on comparative issues in seventeenth-century Spanish and French theater. She is the author of Imperial Lyric: New Poetry and New Subjects in Early Modern Spain (University Park: Pennsylvania State University Press, 2009. Print.). She is co-editor, with Anthony J. Cascardi, of Poiesis and Modernity in the Old and New Worlds (Nashville: Hispanic Issues. Vanderbilt University Press, 2012. Print.) Her current book project is Orpheus' Songs and Amphion's Walls: Lyric, Translation and Nation in Spain, England and France (1550-1800). The book takes a new look at lyric as a category of poetry, and traces how lyrics and translations were separated out from each other in the seventeenth and eighteenth centuries. In addition to her primary research fields, Dr. Middlebrook finds real joy in reading sixteenth and seventeenth century texts: Don Quijote, Góngora's Soledades, the books of Gargantua and Pantagruel by François Rabelais with UO students. She is also interested in the contemporary institution of comparative literature, in pedagogy, in feminism and in the choppy crosscurrents of epistemological shift. "Inclusion, respect and humility across the spectrum of our collective human experience are crucial to me and to the courses I teach. I hope you will join me in setting them at the center of your experience at UO. I also hope that each and every student in my classes, from COLT 101 and 102 through advanced seminars such as SPAN 452/552, 460, COLT 301, 303, 440/540 and beyond will count on me as an ally as you negotiate this big, burgeoning, inspiring and sometimes a little overwhelming campus. Let's work together." Leah Middlebrook received the Herman Award for Distinguished Teaching at the University of Oregon in 2016. She received the Ersted Award for Distinguished Teaching at the junior faculty level in 2007. Look for Professor Middlebrook’s courses in COLT, SPAN and RL! Imperial Lyric: New Poetry and New Subjects in Early Modern Spain, Penn State University Press, 2009. Print. Humanist Studies & the Digital Age. Nathalie Claire Hester, Massimo Lollini and Leah Middlebrook, editors. 2011. Print. Poiesis and Modernity in the Old and New Worlds Middlebrook, Leah and Cascardi, Anthony J., eds. Nashville: Hispanic Issues. 2011. Print. "Poetry and the Persiles: Cervantes' Orphic Mode." Forthcoming: eHumanista. Fall 2017. "From Musaeus to Parnassus: Poetry, Modernity and Method in the Seventeenth Century." Calíope: The Journal of the Society for Renaissance and Baroque Hispanic Poetry. 18.1 (2013). 26-42. Print. "Poiesis and Modernity at the Turn of the Spanish Sixteenth-Century: Luís Alfonso de Carvallo and the Cisne de Apolo (1602)." Middlebrook, Leah and Cascardi, Anthony J., eds. Poiesis and Modernity in the Old and New Worlds,"Nashville: Hispanic Issues. 2011. 3-17. Print. "The Poetics of Modern Masculinity in Early Modern Spain." Milligan, Gerry and Tylus, Jane, eds. "Masculinity in Early Modern Literature of Italy and Spain," Toronto: U. Toronto Press. 2010. 143-167. Print. “On Teaching Petrarch’s "Canzoniere" to Students of Spanish”. Dini, Andrea, and Kleinhenz, Christopher, eds. "Approaches to Teaching Petrarch’s Canzoniere". Publications of the MLA, 2012. 193-203. Print. "Fernando de Herrera Invented the Internet: Technologies of Self-containment in the Early Modern Sonnet". Castillo, David and Lollini, Massimo, eds. "Baroque Reason and Its Others". Nashville: Hispanic Issues. 2006. 61-78. Print.